Stephen Colbert to replace David Letterman on "Late Show"
CBS didn't waste too much time finding a new host for the "Late Show." Exactly a week after David Letterman announced his plans to retire, his successor has been named. Stephen Colbert, the host, writer and executive producer of "The Colbert Report," will replace Letterman in 2015. "Stephen Colbert is one of the most inventive and respected forces on television," CBS Chairman and CEO Les Moonves said in a statement Thursday. "David Letterman's legacy and accomplishments are an incredible source of pride for all of us here, and today's announcement speaks to our commitment of upholding what he established for CBS in late night." Do you think Stephen Colbert is a good replacement for David Letterman? Yes, perfect choice. Nope, I wanted someone else. The 49-year-old Colbert, who signed a five-year deal, said in a statement: "Simply being a guest on David Letterman's show has been a highlight of my career. I never dreamed that I would follow in his footsteps, though everyone in late night follows Dave's lead. I'm thrilled and grateful that CBS chose me. Now, if you'll excuse me, I have to go grind a gap in my front teeth." Colbert's premiere date will be revealed after Letterman figures out a timetable for his final episodes. According to CBS, "Late Show" creative elements, as well as the producers and the location for the Colbert-hosted "Late Show" will be announced at a later date. Moonves says Colbert will not portray his Comedy Central character when he hosts the late-night show. He wouldn't comment on the salary, but told CBS News Colbert will be very happy. The news will leave a big gap in the lineup at Comedy Central, which has aired "The Colbert Report" since 2005. The network issued the following statement Thursday: "Comedy Central is proud that the incredibly talented Stephen Colbert has been part of our family for nearly two decades. 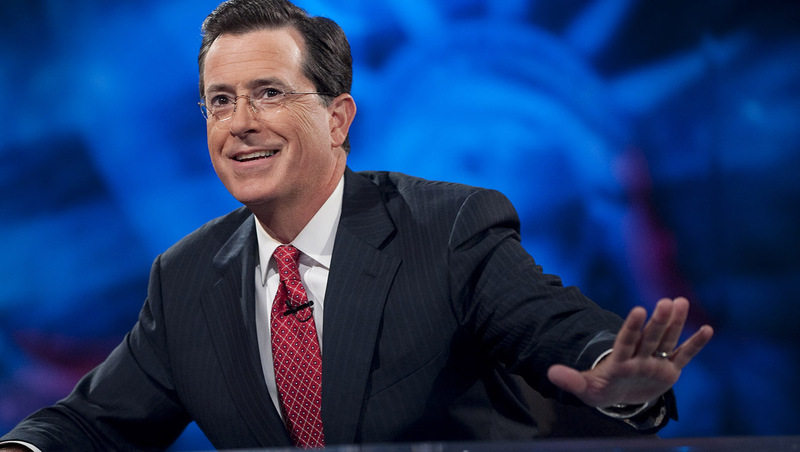 We look forward to the next eight months of the ground-breaking 'Colbert Report' and wish Stephen the very best." "The Colbert Report" has earned two Peabody Awards and 27 Emmy nominations. In 2013, it scored the Emmy for outstanding variety series. The series took home Emmy wins for outstanding writing for a variety, music or comedy program in 2008, 2010 and 2013. Before hosting his own show, Colbert rose to fame as a correspondent on Comedy Central's "The Daily Show." He's also appeared on "The Dana Carvey Show," "Curb Your Enthusiasm" and "Law & Order: Criminal Intent," has written for "Saturday Night Live" and voiced characters in the films "Mr. Peabody and Sherman" and "Monsters vs. Aliens." The Northwestern University graduate was a member of Chicago's acclaimed Second City improv troupe with Amy Sedaris and Paul Dinello. His books include "I Am America (and So Can You!)" and "America Again: Re-Becoming the Greatness We Never Weren't." Letterman, 66, announced last Thursday that he will step down in 2015, but didn't reveal a specific date. "I just want to reiterate my thanks for the support from the network, all of the people who have worked here, all of the people in the theater, all the people on the staff, everybody at home, thank you very much," he said at the taping," he said at the New York taping. Since then, speculation has grown over who should fill his shoes. On Wednesday night, Jon Stewart threw his support behind his Comedy Central pal, saying that Colbert had the perfect skills for the job. Letterman himself also released a statement congratulating Colbert: "Stephen has always been a real friend to me. I'm very excited for him, and I'm flattered that CBS chose him. I also happen to know they wanted another guy with glasses." The "Late Show" airs weeknights at 11:35 p.m. ET. Tell us: Do you think Colbert is a good choice? Take our poll and sound off in the comments below.